Atomic vs Computational force microscopy. The protein being stretched is ankyrin, likely involved in many mechanical processes of living cells; ankyrin repeats are thought to form part of the transduction apparatus in hearing. Mechanical forces are everywhere in human life. Strong forces power machines and cars, our body's forces let us labor and move, soft forces are sensed through touch, even softer ones through hearing. Forces are also ubiquitous in the living cell, driving its molecular machines and motors as well as signaling ongoing action in its surroundings. Man made, force bearing machines rely on extremely strong materials not found in the cell. How can the cell bear substantial forces? 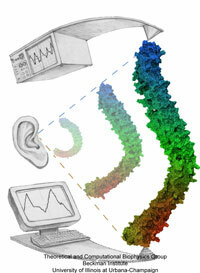 Also, how do cells sense extremely weak forces as in hearing, surpassing most microphones? Single molecule measurements begin to answer these questions offering information on biomolecules' mechanical responses and action. However, the information offered by these measurements is not enough to relate the biomolecular function to the biomolecular architecture. Biomolecules in cells can move in amazing ways, but we did not know why. As a review in Science demonstrates, computational modeling comes to the rescue. It can simulate the measurements and, in doing so, can reveal the physical mechanisms underlying cellular mechanics at the atomic level. In as far as observed data are available, the simulations show impressive agreement with actual measurements. While initially only following experiments or, at best, guiding experiments, modeling has advanced now further and through simulated measurements discovered on its own entirely novel mechanical properties that were later verified by experimental measurements. Experimentalists reacted to the new competition and began to do simulations themselves. The equilibrium dynamics of a biomolecule at the atomic level can be readily observed using molecular dynamics simulations. Even more can be learned about the architecture and function of a biomolecule by using simulations in which external forces are applied to it. These kind of simulations, called steered molecular dynamics (SMD) simulations, were first performed a decade ago following experiments in which atomic force microscopy experiments recorded the unbinding forces of gluing biomaterials at the single molecule level. Steered molecular dynamics has evolved and is now a standard capability of NAMD, featuring two typical protocols. In the first protocol, a constant force is applied to one or more atoms; extension or displacement is then monitored throughout dynamics. Customized time-dependent forces may be applied as well. 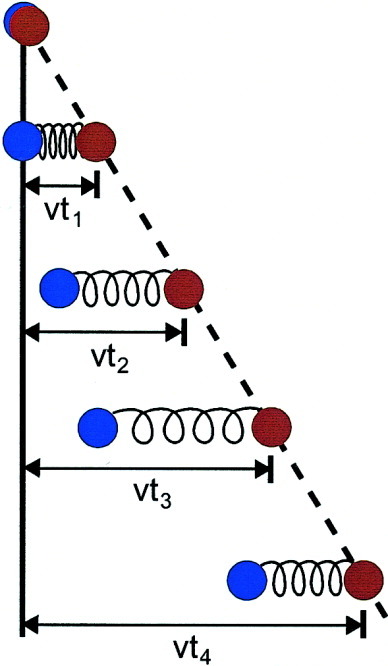 In the second protocol, called constant velocity SMD, a harmonic potential (spring) is used to induce motion along a reaction coordinate (see Figure). The free end of the spring is moved at constant velocity, while the protein atoms attached to the other end of the spring are subject to the steering force. The force applied is determined by the extension of the spring and can be monitored throughout the entire simulation. SMD has become now a standard tool complementing single molecule experiments in vitro. Click here for a movie (mpeg, 4.1M) showing an SMD simulation in which ankyrin repeats are first stretched (tertiary structure elasticity) and then unfolded (secondary structure elasticity). Tertiary and secondary structure elasticity of ankyrin repeats have been observed through AFM experiments as well. Click here for a movie (mpeg, 2.8M) showing an SMD simulation in which ankyrin repeats are unfolded (secondary structure elasticity). The stepwise unfolding of ankyrin repeats observed in this simulation was later on confirmed through AFM experiments. Single-molecule experiments in vitro and in silico. Marcos Sotomayor and Klaus Schulten. Science, 316:1144-1148, 2007. Large scale simulation of protein mechanics and function. Emad Tajkhorshid, Aleksij Aksimentiev, Ilya Balabin, Mu Gao, Barry Isralewitz, James C. Phillips, Fangqiang Zhu, and Klaus Schulten. In Frederic M. Richards, David S. Eisenberg, and John Kuriyan, editors, Advances in Protein Chemistry, volume 66, pp. 195-247. Elsevier Academic Press, New York, 2003. Unfolding of titin domains studied by molecular dynamics simulations. Mu Gao, Hui Lu, and Klaus Schulten. Journal of Muscle Research and Cell Motility, 23:513-521, 2002. Steered molecular dynamics and mechanical functions of proteins. Barry Isralewitz, Mu Gao, and Klaus Schulten. Current Opinion in Structural Biology, 11:224-230, 2001. Steered molecular dynamics investigations of protein function. Barry Isralewitz, Jerome Baudry, Justin Gullingsrud, Dorina Kosztin, and Klaus Schulten. Journal of Molecular Graphics and Modeling, 19:13-25, 2001. Also in Protein Flexibility and Folding, L. A. Kuhn and M. F. Thorpe, editors, Biological Modeling Series (Elsevier). Steered molecular dynamics. Sergei Izrailev, Sergey Stepaniants, Barry Isralewitz, Dorina Kosztin, Hui Lu, Ferenc Molnar, Willy Wriggers, and Klaus Schulten. In P. Deuflhard, J. Hermans, B. Leimkuhler, A. E. Mark, S. Reich, and R. D. Skeel, editors, Computational Molecular Dynamics: Challenges, Methods, Ideas, volume 4 of Lecture Notes in Computational Science and Engineering, pp. 39-65. Springer-Verlag, Berlin, 1998. Molecular basis of fibrin clot elasticity. Bernard Lim, Eric H. Lee, Marcos Sotomayor, and Klaus Schulten. Structure, 16:449-459, 2008. Secondary and tertiary structure elasticity of titin Z1Z2 and a titin chain model. Eric H. Lee, Jen Hsin, Olga Mayans, and Klaus Schulten. Biophysical Journal, 93:1719-1735, 2007. Sugar transport across lactose permease probed by steered molecular dynamics. Morten Ø. Jensen, Ying Yin, Emad Tajkhorshid, and Klaus Schulten. Biophysical Journal, 93:92-102, 2007. Mechanism of gating and ion conductivity of a possible tetrameric pore in Aquaporin-1. Jin Yu, Andrea J. Yool, Klaus Schulten, and Emad Tajkhorshid. Structure, 14:1411-1423, 2006. Structure-based model of the stepping motor of PcrA helicase. Jin Yu, Taekjip Ha, and Klaus Schulten. Biophysical Journal, 91:2097-2114, 2006. Onset of anthrax toxin pore formation. Mu Gao and Klaus Schulten. Biophysical Journal, 90:3267-3279, 2006. Mechanical strength of the titin Z1Z2/telethonin complex. Eric H. Lee, Mu Gao, Nikos Pinotsis, Matthias Wilmanns, and Klaus Schulten. Structure, 14:497-509, 2006. Simulation of the electric response of DNA translocation through a semiconductor nanopore-capacitor. Maria E. Gracheva, Anlin Xiong, Aleksei Aksimentiev, Klaus Schulten, Gregory Timp, and Jean-Pierre Leburton. Nanotechnology, 17:622-633, 2006. Contact Us // Material on this page is copyrighted; contact Webmaster for more information. // Document last modified on 08 Mar 2008 // 8213 accesses since 31 May 2007 .